If you’re fed up with weeds and considering a physical barrier to those pesky plants, learn how to make it work for you. Whether you’re new to gardening or have been at it so long your thumb is a deep shade of green, you may have seen rolls of landscape fabric at DIY stores and gardening centers—and become intrigued. Take our crash course in this material designed to inhibit weeds and keep soil from drying out. We’ll clue you in on the pros versus cons, explain how to pick the best product, and share tips on using it most effectively. Landscape fabric is constructed from woven fibers or manufactured as a solid sheet with perforated holes to allow water to soak through. Some brands offer UV protection to maintain the life of the fabric. It comes in rolls, typically at least 3 feet wide and anywhere from 50 feet to 200 feet, or more, in length. Cost varies from around $.45 per sq. ft., up to $.80 per sq. ft., depending on the brand and thickness (thicker fabric typically runs a bit more). Landscape pins, which sell separately for about $.10 per pin, are necessary for securing the fabric and can add another $.50 per sq. ft. to your total material cost. Note that virtually all landscape fabric is intended to be covered with mulch of any type—wood chips, gravel, recycled rubber, etc. • Prevents weed seeds buried in the soil beneath from sprouting. • Limits the need to use herbicides for weed control. • Helps retain soil moisture by reducing evaporation. • Offers some erosion control on slopes subject to washout from heavy rains. • It discourages garden-friendly earthworms that need to reach the soil surface to survive. Earthworms aerate the soil, so, without them, the ground beneath landscape fabric can become compact and unhealthy. • Natural organic mulch, such as fallen leaves or pine needles, cannot replenish nutrients in the soil because the fabric acts as a barrier. Without fabric, this type of organic matter would naturally biodegrade and eventually blend with the soil. • Weed seeds can still sprout in the mulch used to cover the fabric. While the fabric blocks seeds beneath it from sprouting, new seeds can blow in and—depending on the type of fabric—their roots can adhere tightly to the perforations, making it difficult to pull them out without pulling up the fabric with them. This is especially true if you use organic mulch, such as wood chips, which will eventually degrade and become a virtual plant-growing medium on top of the fabric. If you’ve decided to try landscape fabric, the following practices will help ensure the health of your plants and the longevity of your landscape design. • Choose professional-grade landscape fabric. Cheap stuff rips easily and might not last a single season. The weight and thickness of the fabric is a good determiner of its quality. A roll with a total of 150 square feet that weighs 20 pounds is going to have thicker, heavier fabric than a roll with the same square footage that weighs only 10 pounds. If you’re unsure, ask a reputable garden center to recommend their best landscape fabric. 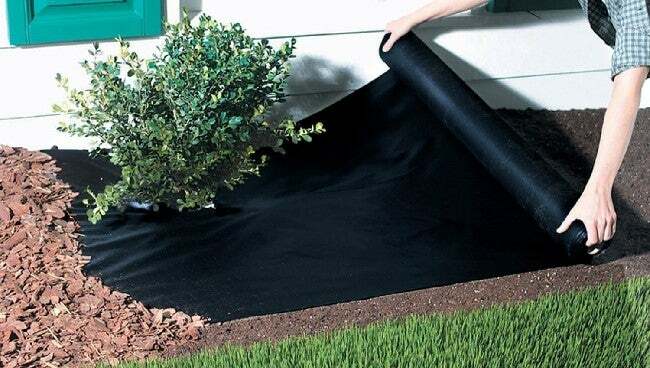 • Add amendments, such as composted manure, peat moss, and other types of organic matter, to the soil before installing landscape fabric—because, obviously, you can’t add them later. If you’re unsure of what amendments to add, take a soil sample to your local extension office, a county office that performs soil testing (usually for a fee), in addition to providing residents with expert agricultural and gardening information. • Level the soil. After adding amendments and working them into the soil thoroughly, level the terrain by breaking up hard clods and raking the surface smooth. • Lay out the fabric with the rough side facing downward. This helps the fabric stay in place while you’re working. • Do not skimp on fabric. Overlap the edges of the landscape fabric by at least 8 inches if you need to use multiple pieces of fabric, and allow a 2-inch overhang around the edges. You can tuck it under later when the rest of the fabric has been secured. Landscaped beds typically have a border, so you can tuck the excess fabric neatly along the inside of the border. Just push it down between the soil and the border with a putty knife to conceal it. • Pin the fabric securely. Insert a landscape pin every 8 to 10 inches along the edges of the fabric and every 12 inches apart in the center of the fabric. Don’t skimp on pins or fabric could come loose in a month or two. • Cut round holes for inserting landscape plants, using a very sharp utility knife. Make sure holes are large enough to plant the specimens you select. • Cover the landscape fabric with 2 to 3 inches of mulch. This layer assists the pins in holding it down, protects it from UV rays, and helps the ground beneath the fabric retain moisture. Plus, mulch adds a beautiful finishing touch to the landscaping! The purpose of landscape fabric is to control weeds, and it’s bound to do its job effectively for the first year or two—but be prepared to pull weeds that may sprout on top of the fabric later. You may wish to apply a pre-emergent herbicide to the top of the mulch, such as Preen (view on Amazon), at the start of every new growing season to help reduce blown-in seeds from sprouting. A pre-emergent herbicide won’t harm established plants. Add mulch as necessary. 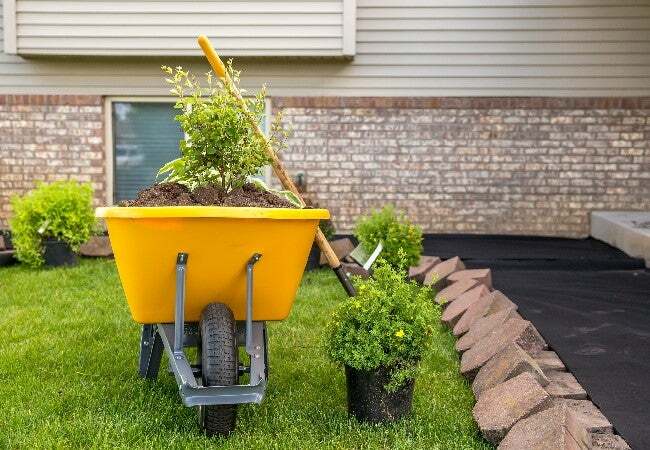 You’ll probably need to with organic mulches that degrade and thin out over time; gravel and rock mulch remain pretty much the same as when first applied.